Boasting a spectacular view over the sparkling turquoise lagoon, Villa Alicia provides guests with a direct access to a stretch of silky beach where they can soak in as much Vitamin D as they want. Best of all, as a guest of Villa Alicia, you can also access the nearby luxury hotel and enjoy the spas, bars and restaurants. 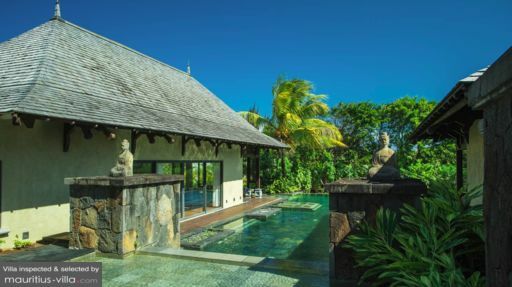 Designed to comfortably sleep eight people, this self-catering villa additionally provides you with a plethora of amenities to render your holiday as enjoyable and relaxing as possible. At Villa Alicia, you can benefit from three air-conditioned bedrooms comfortably enhanced by large beds, closets, bedside lamps, desks, safe and the likes. Each bedroom has its own bathroom with shower, double sink and toilet. Additional beds can be set up upon request. Guests will undoubtedly be enthralled by the luxury exterior reminiscent of 5-star hotels. Indeed, Villa Alicia has a shady barbecue area where you can enjoy a delectable Al-Fresco dinner surrounded by family and friends. 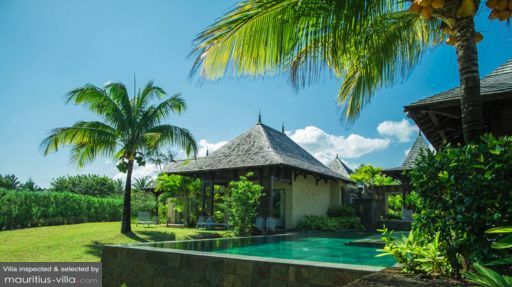 The villa is surrounded by a large tropical garden with towering pine trees to provide some much-needed shade, but you can also make the most out of the numerous sunbeds to soak in plenty of the warm tropical sunlight. To cool off, you can enjoy a nice dip in the massive pool or simply float leisurely as you enjoy a perfect view of the ocean. The patio has comfortably been set up with an outdoors dining set, enabling you to enjoy your dinners under the stars. Villa Alicia features an airy and spacious interior with modern fixtures and comfortable furnishing. The living room for example, is equipped with a large couch, a coffee-table and flat-screen television for cozy nights in. Inside, you will also find a beautifully furnished dining room as well as a fully equipped kitchen with a coffee machine, fridge, dishwasher, stove, oven, microwave and the likes. All the living areas either overlook the garden, the pool or the ocean. These rooms are also fitted with fans and air-conditioning units. To guarantee a relaxing and comfortable stay, Villa Alicia offers a wide range of services such as the Oazure Concierge service which is available seven days a week. In addition, you can also enjoy the services of a housekeeper who will show up every day from 9am to 3pm. A gardener also regularly visits the grounds to ensure that the lawn is always beautifully manicured and well taken care of. As a guest of the villa, you will receive a special welcome hamper containing different types of bathroom amenities, sarong, Nespresso capsules, wine, water and even a free meal for your first night at the villa. Beach and bathroom towels, as well as linens are also provided, along with high chairs and baby cots. 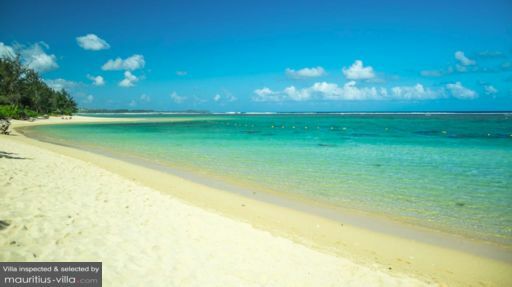 Villa Alicia is a mere 15-minutes’ drive away from Belle Mare beach, one of the most pristine and scenic beaches on the island. Guests can also visit the fisherman village of Bel Ombre, where you can buy fresh seafood and other types of groceries. Bel Ombre additionally sports several small markets where tourists can shop for souvenirs, sarongs, clothes, makeup, accessories and other types of local crafts and delicacies. A mere five minutes away from Villa Alicia is hotel Sofitel, a five-star resort, where you can enjoy discounts on different types of spa services.